Mosque architecture and the most basic Islamic truths reflect each other in tremendously rich ways. Islam has 5 pillars of faith, and the main one is the Shahadah. It declares that God is One and unified, and that Muhammad is His prophet. Islamic art and thought revolve around these 2 ideas. Mosque architecture is centered on them, and building and faith conjoin in ways that make the Islamic world one of the globe’s most beautiful cultural landscapes. The most basic idea in Islamic theology is tawhid (oneness). God is whole, unique, the creator of all, and above His creation. There is no god but God. The worst sin is Islam is shirk, or diminishing God’s greatness and obscuring His oneness. Polytheism is shirk, and so is belief in the Trinity. There is only God, and nothing should distract people from appreciating Him. Mosque architecture helps people focus on a unified and unique god. 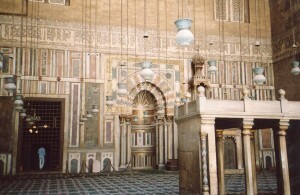 The two pictures above are of the most central part of the mosque, the mihrab. I took the top photo in Jama Masjid, Delhi (the largest mosque in India), and the bottom shot in the Sultan Hasan Mosque, in Cairo, Egypt. The mihrab faces the Ka’ba, in Mecca. Every Muslim turns towards Mecca when he prays, so all worshippers in the mosque face the mihrab. Instead of an altar, priests and images of deified beings, there is only this blank space that people focus on. 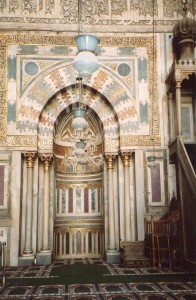 The mihrab is often ornately decorated. 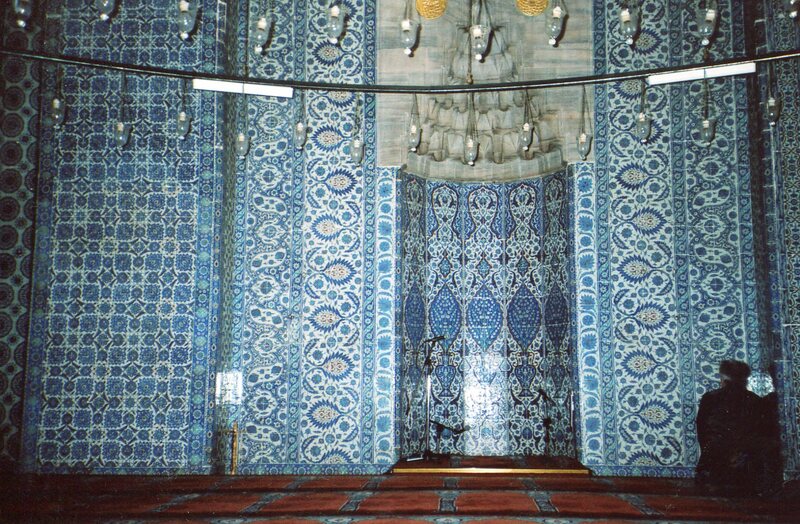 Designs reflect the many different cultures that Islam has spread through. 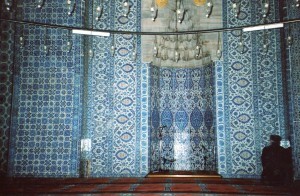 The above picture is from the Rustem Pasha Mosque in Istanbul, and it’s full of Iznik tiles. 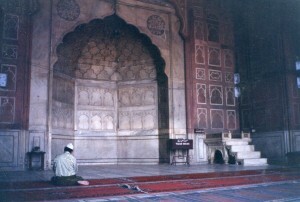 This mosque is much smaller than the other 2, and it has an intimate atmosphere. 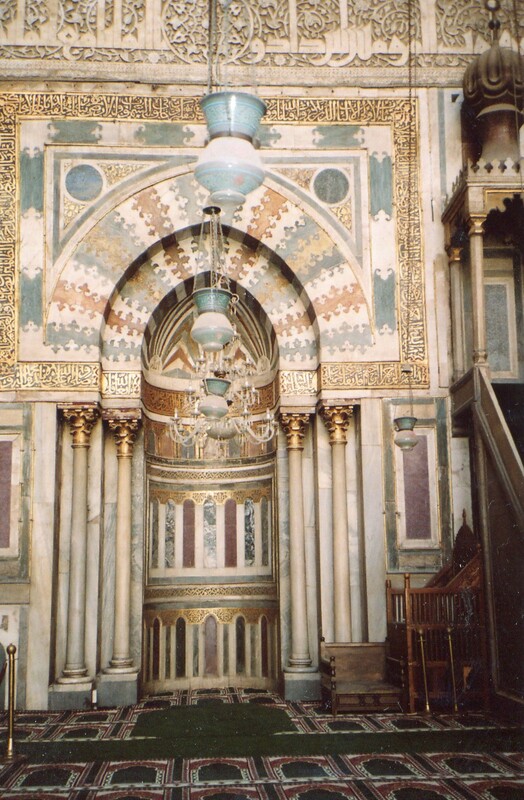 But in spite of the beautiful designs and cultural variations, the mihrab’s hollow form reminds people that God is everywhere, and yet cannot be defined. Folks sit on the prayer rugs, and try to center their thoughts on the One who created all. Mosque architecture is supposed to optimize this focus. 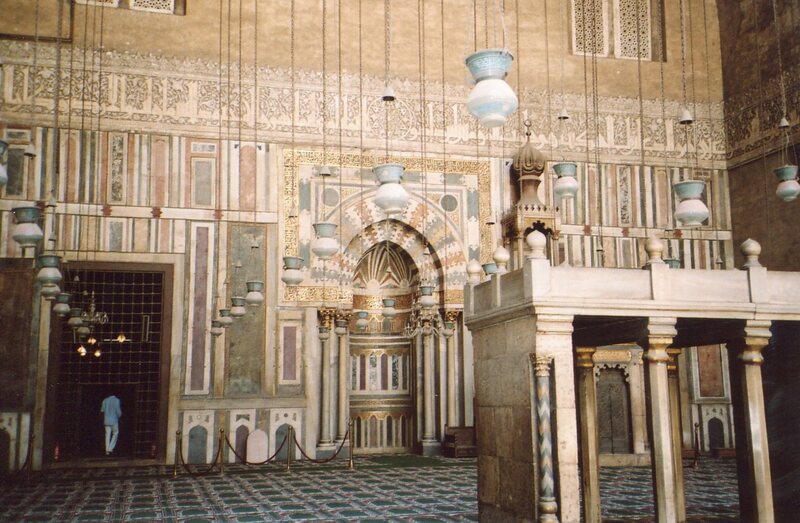 In the next post, we’ll explore more depths in mosque architecture. The world’s varieties of religious beliefs comprise a boundless treasure chest.